28 arrested, 15 police officers wounded in protests against Prawer bill; Southern District chief: There is an attempt to start a war here. Beduin Israelis and their supporters staged violent protests in several locations across the country on Saturday against the controversial Prawer-Begin resettlement bill currently being debated in the Knesset. Clashes between police and demonstrators were reported, inter alia, at the Hura Junction in the Negev, in Haifa and in east Jerusalem. Some 15 police officers were lightly wounded and 30 protesters were arrested. The Prawer-Begin bill is a five-year economic development initiative seeking to regulate Beduin settlement in the South. It aims for a compromise solution for tens of thousands of Beduin currently scattered in unrecognized villages throughout the Negev, legalizing 63 percent of claimed land. Among the police who were hurt were Coastal District Commander Haggai Dotan; Navah Tabo, the spokeswoman of the Negev subdistrict; and an officer from the Central District who was stabbed in the leg by a protester. 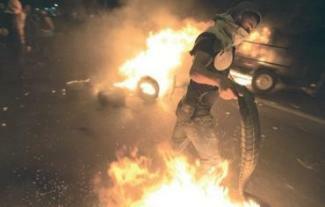 The protesters hurled rocks, firebombs and other objects, said national police spokesman Micky Rosenfeld. Some 1,500 demonstrators gathered at the Hura Junction. Some were seen waving PLO flags, Israel Radio reported. Police had been aware of attempts to boost tensions and bring a new round of violent protests in Israel, Southern District Commander Yoram Halevy said Saturday night at the site of the protests in Hura. There were still a few hundred protesters at Hura and in Haifa by the time Halevy made his comments, but police said they had managed to establish control of both locations. They deployed hundreds of reinforcements in Hura and Haifa, and employed a number of crowd-dispersal methods, including tear gas, stun grenades and water cannons. There were also protests off Highway 444 in the Triangle, where many Arab cities and villages are situated adjacent to the Green Line, and outside the Damascus Gate in east Jerusalem, where police used water cannons to disperse over 100 Arab rioters. A small protest also took place in Jaffa on Saturday evening where some seventy people gathered at the Clocktower Square blocking traffic intermittently, Israel Radio reported. Prime Minister Binyamin Netanyahu spoke Saturday night with Public Security Minister Yitzhak Aharonovitch and the national police commander, Insp.-Gen. Yohanan Danino, about the protests. He praised the police for their determined actions against the demonstrators, according to a statement released by the Prime Minister’s Office. “We will treat offenders to the fullest extent of the law and will not tolerate such disturbances. We have – and will have – no tolerance for those who break the law,” Netanyahu said. “Attempts by a loud and violent minority to deny a better future to a large and broad population are grave. The headquarters of the Economic and Community Development of the Negev Beduin in the Prime Minister’s Office, headed by Maj.-Gen. (res.) Doron Almog, issued its own statement. “The government of Israel regrets that extremists, many of whom are not Beduin, chose to divert the open debate about a purely social and humanitarian cause into a confrontation, falsely linked to the Palestinian issue,” the statement said. “Alien interests” had been behind the protests, which were not based on a “sincere concern for the Beduin,” it said. “We call upon the Negev Beduin to take a stand for their own future and not let anyone else abuse and manipulate this process for alien causes,” it added. In an interview with The Jerusalem Post Saturday night, Almog called the protests politically motivated and in no way connected to the genuine concerns of the Negev Beduin. He accused leaders of the Israeli Arab parties Balad and UAL-Ta’al, as well as the Islamic Movement, of being behind the protests. He insisted that the majority of those at the protest in Hura were from the Negev, and that saying otherwise was just an effort to delegitimize the protests. Abo Kwedr denied that the Prawer-Begin bill was a compromise solution, saying it had been drafted without consulting the Beduin community. He added that the protests should be seen as a “warning sign” for what could happen in the future. “As we saw today, the community will react,” he said. “It is our duty to stop the situation in which there are some citizens to whom the laws of planning and construction apply and there are others who ignore them and use violence to ensure the laws don’t apply to them,” Liberman wrote on Facebook. “This isn’t a social problem or a housing crisis, but a battle for the land,” the foreign minister and Yisrael Beytenu chairman said. He called for the government to deal with the situation by building modern cities for Israeli Arabs, with tall buildings and infrastructure. “Building permits are not only for Jews,” he declared. He also called for the government to reexamine the Prawer- Begin plan and cancel benefits the Beduin were supposed to receive, saying if there could be no agreement on the entire bill, none of it should be implemented. In response, MK Ahmed Tibi (UAL-Ta’al) called the foreign minister a fascist and “an immigrant who lives on land stolen from Arabs.” Liberman came to Israel from Moldova and lives in the West Bank. Deputy Defense Minister Danny Danon (Likud) called for his Knesset faction to discuss the bill. “It cannot be that we are giving state-owned land and getting uncontrolled violence,” he said. Opponents of the bill claim the legislation would result in up to 40,000 Beduin losing their land. Former minister Bennie Begin is handling the Prawer-Begin bill on behalf of the government. It is currently being deliberated in the Knesset’s Interior Committee. The plan will cost NIS 7 billion, NIS 2b. of which would be earmarked for compensation to those whose land claims are not addressed, Israel Radio reported. Almog added that there is approximately an additional NIS 3b. that is budgeted for the plan, but is not included in the bill. Demonstrations were also being planned in a number of European and Arab countries to mark the so-called international “day of rage” against the legislation, the Post has learned. The Foreign Ministry is taking the international campaign seriously in light of increasing interest in the issue by governments and NGOs, particularly in the US and the European Union, where objections and protests are garnering publicity. The letter was signed by, among others, musician Brian Eno, artist Antony Gormley, actress Julie Christie and film director Mike Leigh. Daniel K. Eisenbud and Tovah Lazaroff contributed to this report.